Utilizing state of the art laboratories, Dr. Mariana Savel, DDS customizes bridges and crowns that are natural-looking and can replace one or a section of missing teeth. 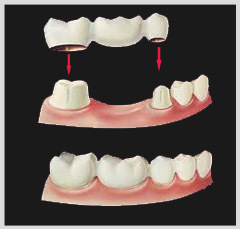 Since they are custom-made, bridges and crowns are barely noticeable and can restore the natural contour of teeth as well as the proper bite relationship between upper and lower teeth. Please contact our Staten Island Dental Office with any inquires and for appointments.